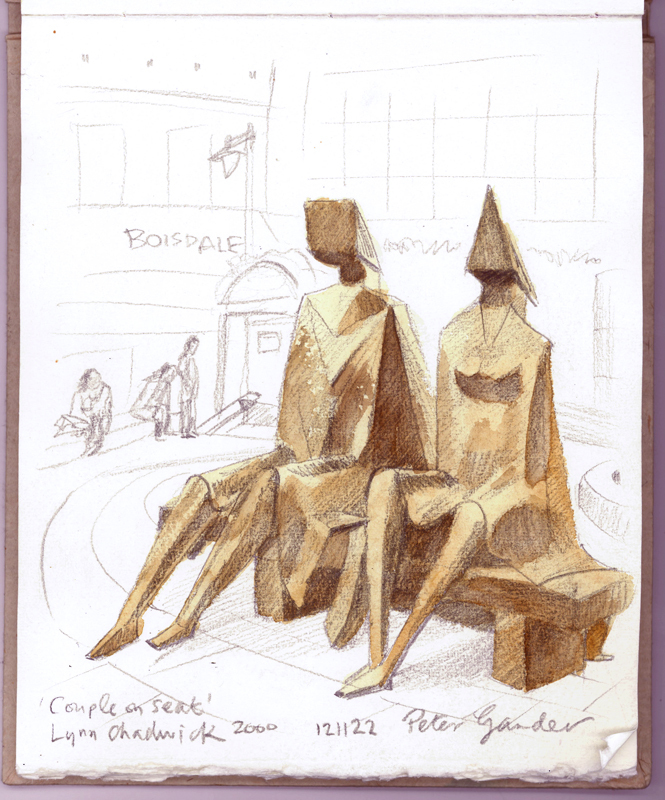 ‘Couple on seat’ bronze by Lynn Chadwick 2000. 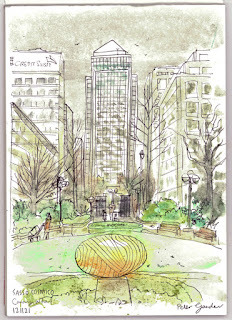 Canary Wharf, London. Strong winds again today but dry at least. 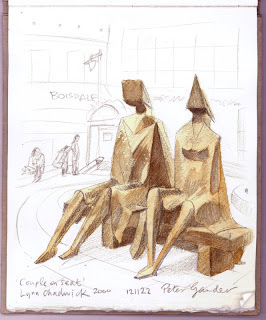 Right outside the Ogilvy office is this bronze by Lynn Chadwick. I was surprised to see the date of 2000, having presumed it was a 1970s piece, similar to the Henry Moore abstracted figures that I used to see around Harlow, Essex when I was younger. 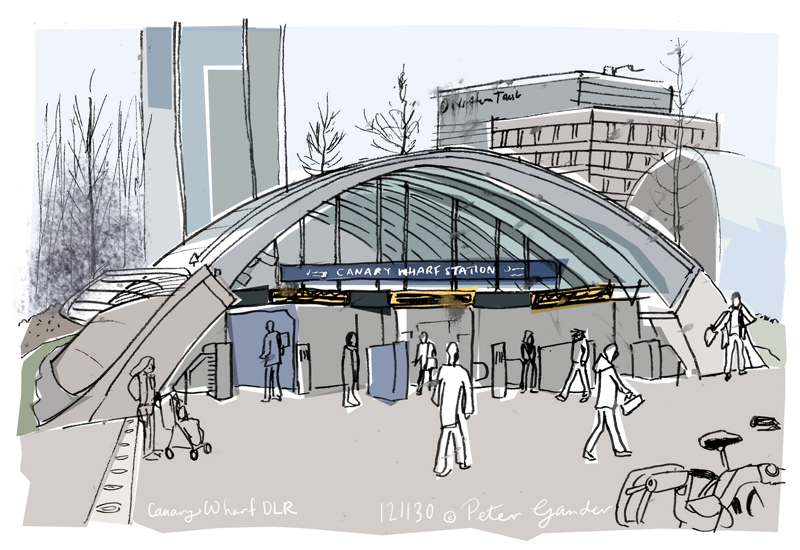 A ring of tiered seating surrounds this and a fountain, so I had a comfortable sketching position. Drawn with a soft (7B) pencil, the paper’s tooth was rather too rough for any subtle variations of tone, but the wash of sepia over the top helped with that. Dry pigment on the brush dragged upwards (left figure) lent an appropriately rough texture in places. 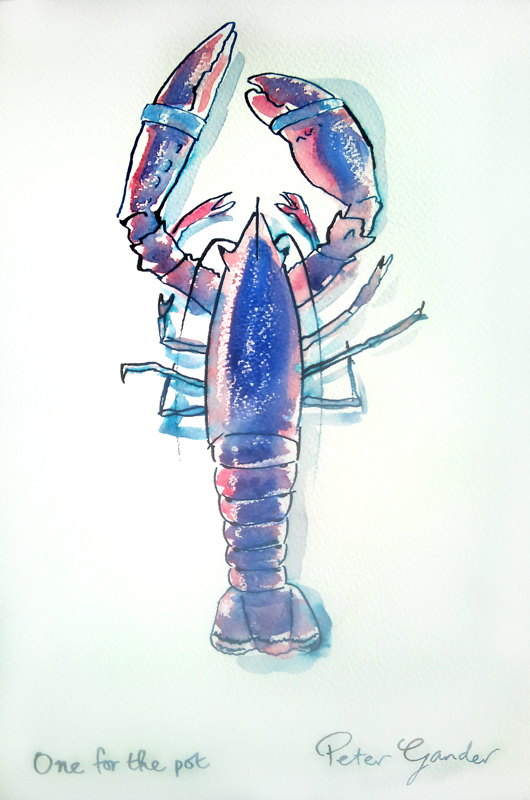 Winsor and Newton watercolour on 210gsm Khadi (Indian handmade) ‘rough’ paper pad. A grey day in London. 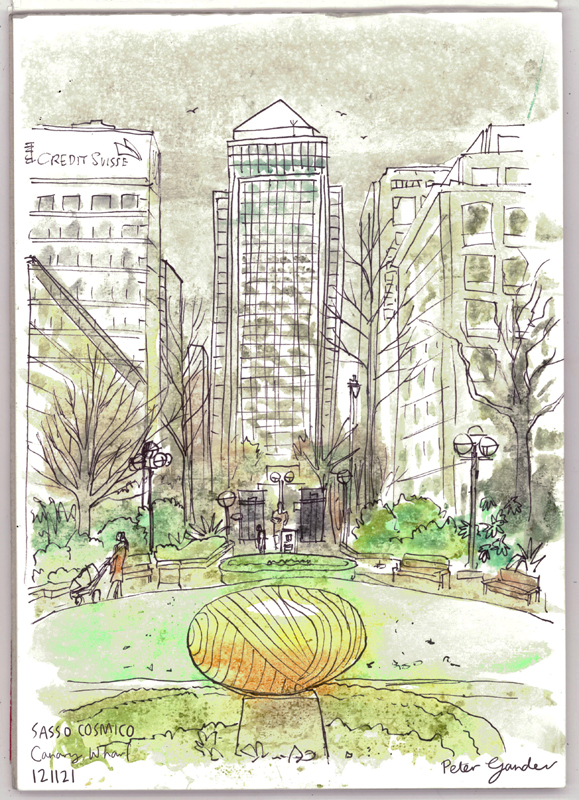 Raining, in fact, so nowhere to sit down and sketch but would have sketched this standing up anyway, for the best viewpoint of this dynamic view down to the famous Canary Wharf tower. In the foreground is a sculpture entitled ‘Sasso Cosmico’, by Do Vassilakis-Konig (bronze and steel) 2007. This view will be familiar with commuters like me who get the Thames Clipper boat into the wharf. The very fine rain added an interesting dotty texture to the painting, visible in the sky especially. The woman pushing the pram, lower left, circled the small park continuously for as long as I was there, a good 40 mins! 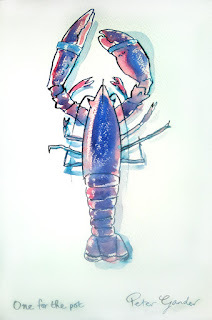 Staedtler Permanent Pen and Winsor & Newton watercolour on 130gsm cartridge paper (the latter was too thin/non-absorbent for such a well-soaked job really). KNOCKER WHITE is a traditional Thames tug, built in 1924 by T. van Duivendijk, Lekkerkerk, Netherlands as CAIRNROCK, for Harrisons Lighterage Company, London. She was traditionally steam-powered. She later passed into the ownership of W. E. White & Sons, Rotherhithe, and in 1960 was renamed with the nickname of one of the White family. She was converted to diesel power with the installation of Petters engines, and alterations were made to both the funnel and wheelhouse. In November 1982, she was sold for scrap, and parts of her engines were removed. 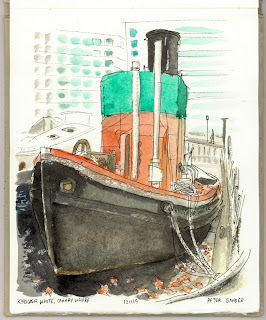 In 1984, after a 60 year working life, she was reprieved and became part of the Museum of London Docklands. Source: Paul Brown, Historic Ships The Survivors (Amberley, 2010), updated Feb 2011. Winsor & Newton watercolour (squirrel mop brush) on 210gsm rough Khadi (Indian handmade) pad (from Paperchase).